Cross-selling is the action or practice of selling an additional product to an existing customer. This is a great way to increase your average order value (AOV) by promoting other product categories in the same niche! What does this mean for Viralstyle Sellers? With the Viralstyle Cross-sell & Add To Cart features on 3.0, you can now offer recommended products at the bottom of any sales page. Not to be confused with up-selling (offering an additional product after checkout), cross-selling will now give your customers the ability to add multiple niche/recommended products to their cart and check out! After you have created your design (Step 1), then set your products & pricing (Step 2), you will have reached the "Launch" page, when launching a campaign. Creating recommended products to Cross-sell. Adding the campaign to a collection with a matching tag (no covered in this article). It is very important that you create a tag for every single campaign you launch, from this point forward! • You will not be able to cross-sell campaigns that are hidden from the Viralstyle Marketplace. 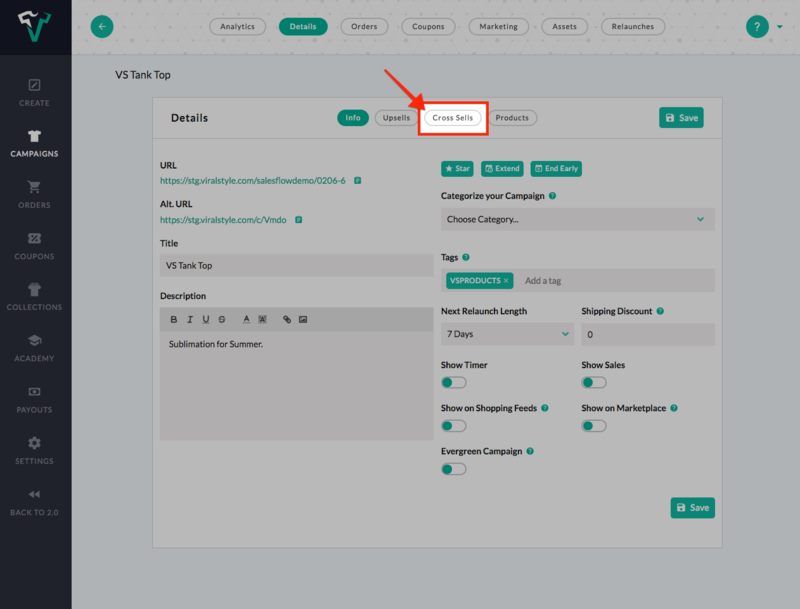 • You will not have to opt in to the new feature, and your campaigns will be automatically cross-sold if the campaign has at least one tag defined. • The campaign's first tag is used for cross-sells by default if no cross-sell tag is defined. First, add the tag that you'd like to use for this recommended products group. In this example, I will use "VSPRODUCTS" as the tag. This is the tag I will use for all Viralstyle products that I launch. Adding this tag to all of my Viralstyle products will ensure that the top 5 selling campaigns with this tag will be listed as "recommended products". You will find the "Tags" field between Categorize Your Campaign & Email List on the Launch page. 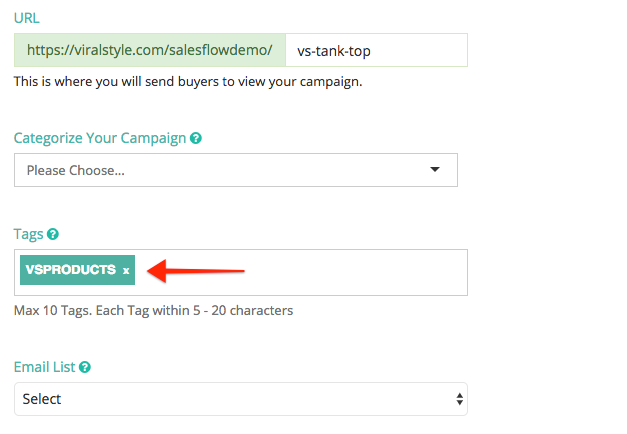 You can also create a tag after launching, on the campaign details page. Click the options (•••) slider to the right of the campaign in question > details > tags (add tag). Be sure to SAVE your work before you proceed. Now that you have created a tag for each of your campaigns, it is time to select which products you'd like to offer as recommended products at the bottom of the campaigns sales page. I used the tag "VSPRODUCT" when launching all 5 campaigns you see above. If I want to list these campaigns at the bottom of the said sales page, I have to open the campaign and assign this tag. Click the options (•••) slider to the right of the campaign in question > details > cross sells > drop-down (select tag) > SAVE. 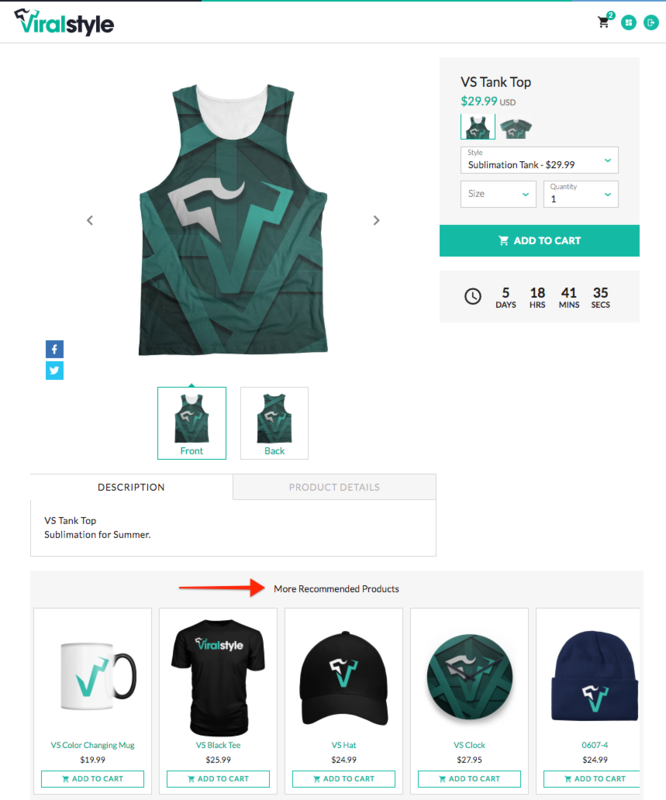 Let's take a look at the VS Tank Top sales page below, this is what a group of recommended products will look like. Keep in mind, I have used the tag "VSPRODUCTS" for all the recommended products you see below. You'll start to see your average order value (AOV) skyrocket after adding tags to your live campaigns. Getting back to our previous statement, it is very important that you create a tag for every single campaign you launch, from this point forward. But you may also want to create a tag for campaigns that you have launched in the past (especially if your paying for traffic). Here is what it will look like from your customers perspective. They can now add multiple products to cart, or remove and continue shopping, never leaving the sales page! When they're done building their order, they can checkout using the Viralstyle Shopping Cart. Cross-selling is about getting the most out of the traffic that comes through/to your offering. You want to maximize your per-customer sales, and you want to give your customers more bang for their buck.